Megan's first life was with Linda in Toronto; her second life was with June in London; her third life was spent with us for 2 years, and we enjoyed having her here. She was determined to have her "place," yet could be extremely friendly, licking us endlessly when she wanted to show affection. 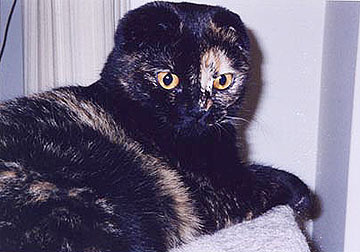 Megan now lives with Troy and Shelley in Scarborough, Ontario. Her fourth life as a retired breeder will be a quieter one, with no competition from the other girls in the house. She will, however, miss the kittens. She was a wonderful mother and a superb nanny, taking the little ones under her paw. We wish Megan well in her retirement. "He's by far the nicest kitty we've ever had and we thank you both for giving him to us because he makes life so much more interesting and I'm sure that we have another million laughs to come yet." Caileigh can be quite shy sometimes, but playful, too, when she's comfortable in her surroundings. She loves to be petted, but not picked up and held, preferring individual human attention. 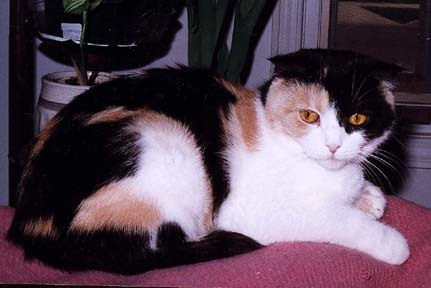 She is a beautiful calico, with a distinctive black patch over one eye. 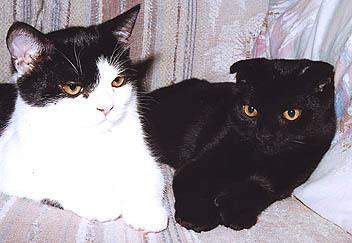 Simon and his brother, Domino (Domino now lives in London, ON), were two very close buddies when they were young. They would do everything together. 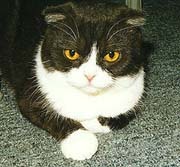 Simon went to a few shows, and even won a BEST KITTEN rosette. 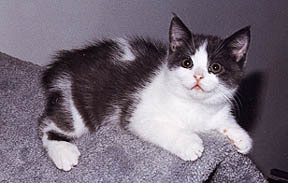 Now he shares his life with Ben and Christine in Toronto, Ontario, and rules the roost, along with his little sister, Tinka Belle, who came along a bit later. Now they all live in happy harmony. 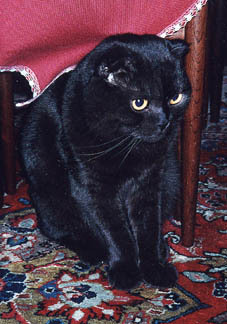 Simon has the distinction of being selected as the Winner of the Week in the Page-A-Day Cat Calendar on February 7, 2000. Congratulations, Simon! 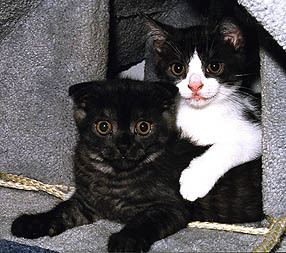 Oreo and Black Mac are brothers but very independent from one another (you wouldn't know it from these pictures). Black Mac is a quieter boy, content to watch, sleep or play only when he really wants to. Oreo is always around somewhere, involved and not often sleeping. Black Mac is now gone to his new home in Ballston Spa, New York. Oreo lives in London, Ontario.